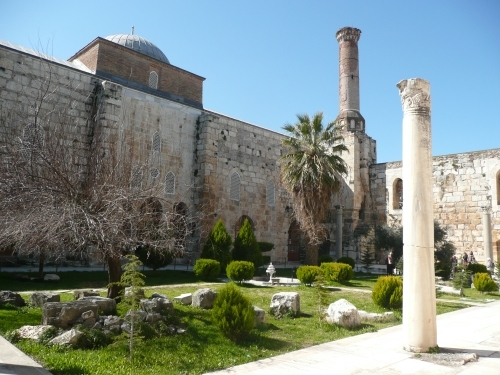 After exploring Ephesus and the Basilica of St John the previous day, on Sunday the 4th of March we went to the Isa Bey Mosque, the Temple of Artemis, one of the ancient Wonders of the World, the Ephesus Museum and had a walk around the town. The mosque was a nice enough building, still apparently functioning as a place of worship. 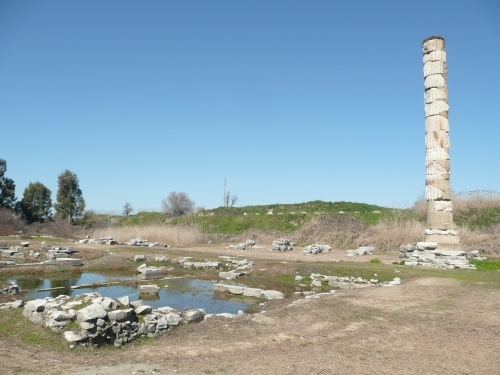 The Temple of Artemis, while at one time impressive enough to be counted a Wonder of the World by Herodotus, is now a fairly unimpressive ruin, with one and a half rebuilt columns, a few ruined walls and a large pool. 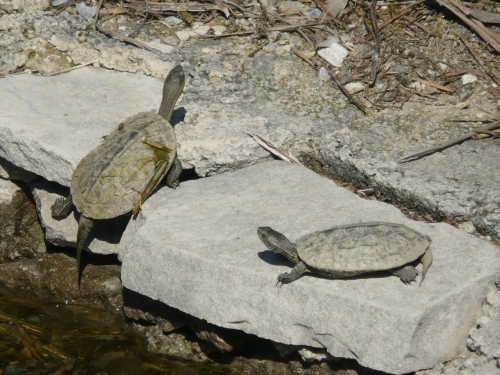 The most interesting part of visiting the Temple was all the terrapins sunbathing on the side of the pools. We saw a few by the side of some pools in the ruined chambers. Then, as we got to the large pool at one end, there were dozens of large ones that all tumbled into the water when they saw us. 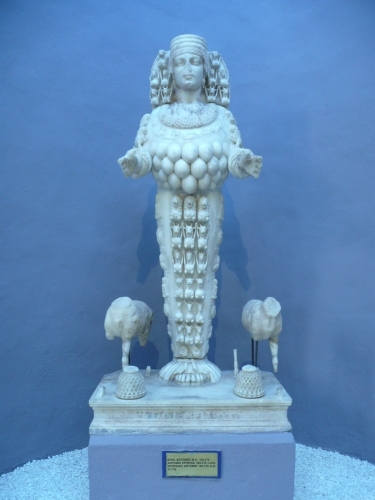 The Ephesus Museum had various interesting relics – statues of Artemis with either many breasts or testicles covering her torso, for instance. Later in the day, we walked to the other side of the town with the aim of maybe walking up a hill. 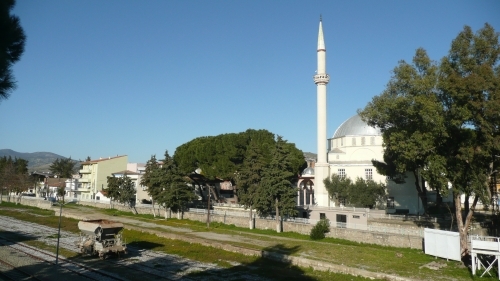 We went over the railway, passed a mosque and through a residential area. When we got to the foot of the hill, a bunch of children came to us and started demanding we take their picture – we went back pretty quickly. We were back at the railway station the following morning, to get a train to Izmir Airport. From there, we flew to Athens. I’m pretty behind on my blogging. We’re already in Albania, but I’ve yet to say anything about the latter part of our stay in Turkey or anything about Greece. We left our Istanbul hostel before dawn, got a shuttle minibus to the airport and flew to Izmir, a city on the west coast of Turkey; the flight was less than an hour. 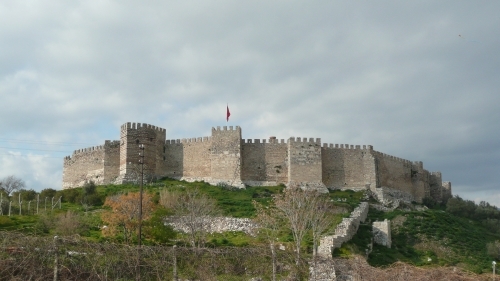 From the airport – after hanging around while Habiba’s mum tried unsuccessfully to reserve tickets and seats – we took a coach to a bus station – or otogar – in Izmir. 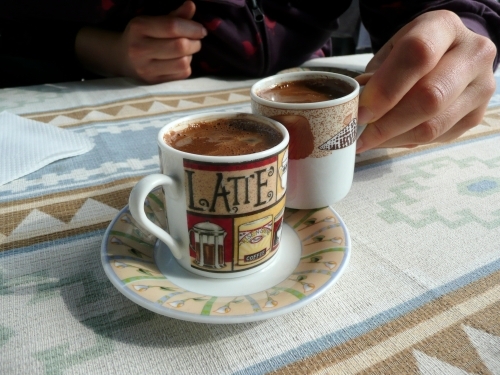 We found a place to take a minibus to Selçuk and, with half an hour before it left, we decided to get breakfast. The food took quite a while to prepare – fifteen or twenty minutes, maybe – so we tried to eat quickly. The bus guy saw me standing up and wolfing down food and he made reassuring, plenty-of-time expressions. When I went out ahead of the others a few minutes later, he was taking our bags off the minibus. I told him we were ready and were taking the bus, so he loaded our bags on again. I then had to stand half on, half off the bus while we waited for Habiba to retrieve her mum from the bathroom. Then, when they got on, everyone was looking for me, not realising I was already seated. Fun. 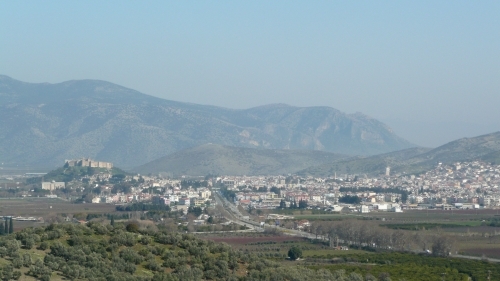 Selçuk turned out to be a lovely countryside town, nestled in a dry, Mediterranean valley strewn with olive orchards. We stayed at Atilla’s Getaway, run by Atilla, a Turkish Australian. He was very friendly and attentive – we were the only guests there most of the time, so we received lots of attention. The hostel was a few kilometres outside Selçuk and he provided a shuttle service at regular intervals; however, being the only people who needed shuttling, he and his staff took us back and forth whenever we wanted. They also cooked decent breakfasts and dinners for us. 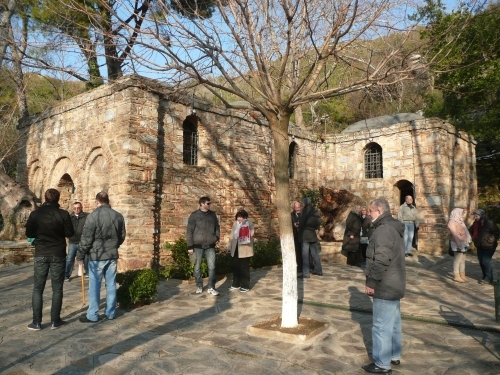 Our first sightseeing expedition was to take a taxi to the House of the Virgin Mary. This is an old, pretty stone house on a hill several kilometres from Selçuk that is supposed to have been where Jesus’s mother lived out her life after Jesus’s execution. Inside, it’s been made into a little church, where people reverently shuffle through the front door and an antechamber, into the main room and out through a side room. Although there is a local tradition about it, the house became famous only after an 18th century woman had a ‘vision’ of the place. Catholics searched for it and a hundred years later, a German decided he’d found it. Supposedly, the woman’s descriptions were amazingly accurate, right down to the ‘rectangular stones’ the house was built from – so few buildings utilise rectangular masonry, so it must’ve been the place. I made a point of expressing my doubts about the whole story, and Habiba and Noor made a little fun of my scepticism. 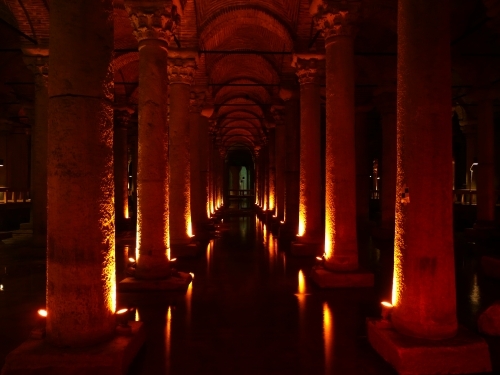 For a building that’s supposed to be two thousand years old, it’s in pretty good condition. Additionally, while several popes have visited the place, the Church doesn’t officially recognise it as what it’s claimed to be because of the lack of evidence. The next day, we walked from the hostel along a dirt road on the side of the valley to Ephesus, or ‘Efes’ in Turkish (which is also the name of a Turkish beer). 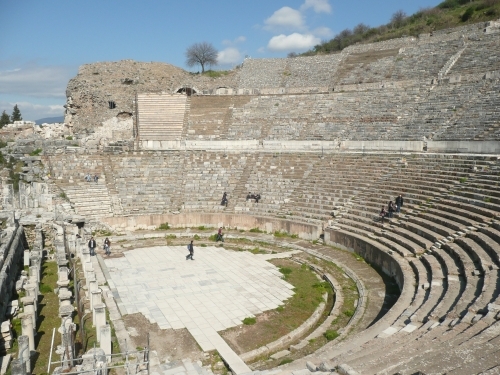 Ephesus was once a port – although the sea is now some distance away – and the most important Greek city in Asia Minor. What remains now is a large complex of ruins in the countryside. We reached a little townlet at the upper gate with cafés and souvenir shops and entered there, passing by a small amphitheatre and various ruins, along marble-paved streets with several semi-restored doorways and façades, until we got to the two most impressive ruins, the Library of Celsus and the 25,000-seater theatre. Because of the scale of the site and the way in which it’s all linked together by streets, you get a better sense of, or you can better imagine what the place was like a couple of millennia ago. We took our time wandering around, taking lots of photos, reading the signs. 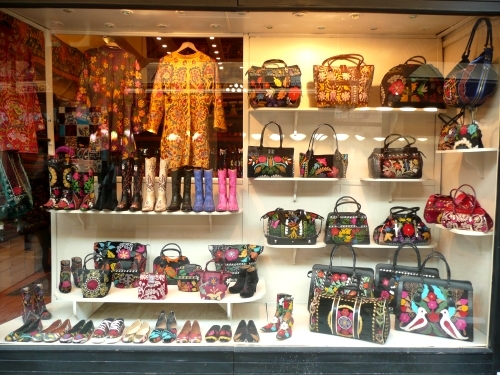 It wasn’t too crowded; there was a sprinkling of tourists and an exuberant school group. By the time we reached the Library and theatre, however, we were getting tired and were ready to head back to town. There were several cats around the ruins. 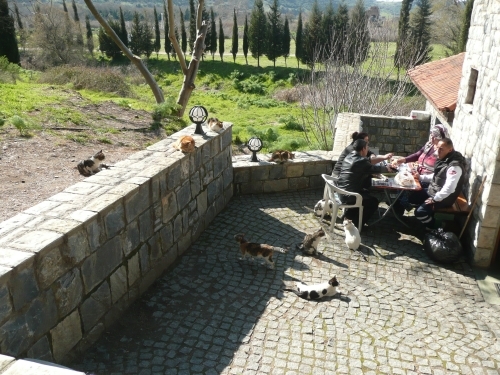 At the lower exit, a family was having a picnic near the toilets (which doesn’t sound too appetising, but the WC was a very pleasant building) and they were surrounded by about a dozen cats. Quite amusing. 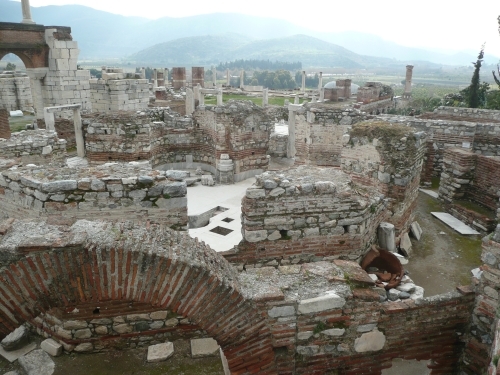 Later, we wandered around the market in Selçuk, had lunch and went to the ruined Basilica of St John, another impressive ruin – although not quite on a scale with Ephesus. It was overlooked by a castle on the nearby Ayasoluk Hill, which we didn’t go to. 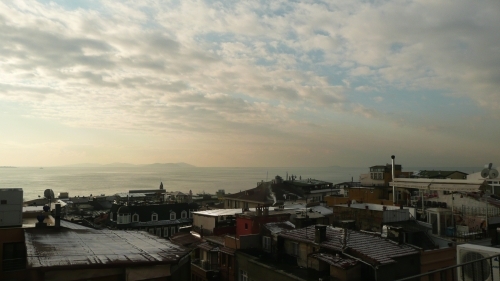 While Istanbul had been wintry, with clouds, snow and strong winds, Selçuk had perfect weather. The skies were mostly blue and, while the air was cool, it turned out to be quite warm in the sun. 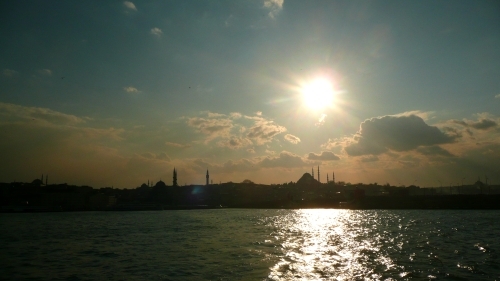 After the travails and drama of Monday, Tuesday, our first full day in Turkey, was a pleasant relief. We had an en suite room to ourselves at our hostel, Sydney Hostel Istanbul, which consisted of little more than three beds. One of the beds was a double, so Habiba and I slept there; the other bed got piled up with our belongings. While the room was tiny, the free breakfast was a buffet of bread, olives, cheese and salad, so we had no complaints about the place on balance. 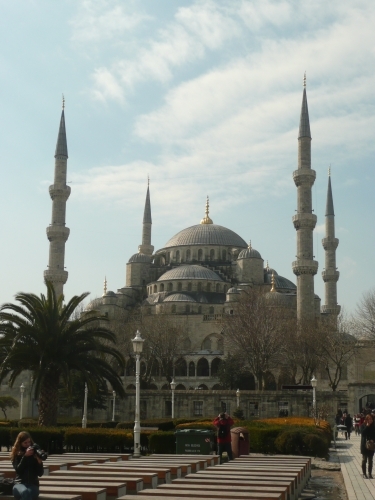 First port of call on Tuesday was the Hagia Sophia. 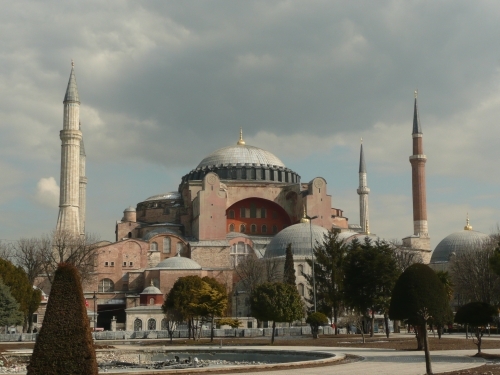 The Hagia Sophia was originally an Orthodox church and is about 1500 years old. 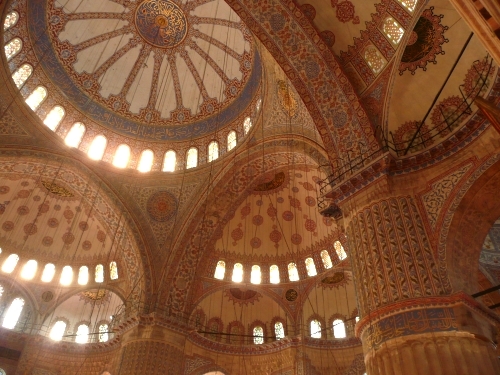 It later became a mosque – it’s filled with Islamic-style designs and calligraphy – and was made a museum in the 1930s. It’s a genuinely magnificent building and from the outside looks like a agglomeration of different buildings all piled on top of each other. Inside, the domes soar high above and the space is strung with chandeliers that hang down to what seems only a little above head height. We queued up outside, waiting to buy our tickets, and turned down various offers from guides. Once inside we wandered around and took lots of photos – I didn’t take as many as I’d have liked because my camera battery ran out of juice. From the grand ground floor, you’re able to walk up a dungeon-like corridor to an upper level for a bird’s eye view of the tourists below. Some highlights of our visit included the beautiful mosaics – partially destroyed – an example of grafitti made by a Viking on a balcony. Most amusing of all, was a cat that was lying with its head and front paws on one of the powerful lamps by the pulpit or mimbar. It drew a big crowd of people taking photos. 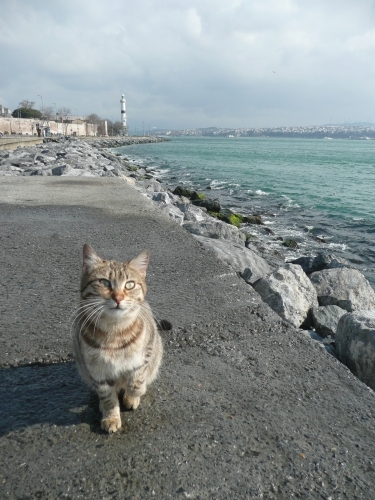 The reason the cat was on the lamp was that it was very cold in Istanbul at the time – it was snowing a lot of the time and the wind was often fierce. We had to wrap up in multiple layers, and still it felt pretty bitter. We had been expecting the weather to be, if not warm, then much milder than that. We also had a look around the Grand Bazaar and the Spice Bazaar, crossed the Galata Bridge and had a look at Galata Tower (but didn’t go in; Galatasaray football club takes its name from this area), walked up Istiklal Avenue – like a Turkish Oxford Street, except with a tramline running down it – and met my friend Peter’s brother – Matthew. He took us to a restaurant for dinner and gave us lots of information on things to do in the city. Peter is an extremely nice guy – and Matthew, despite looking different, is very reminiscent of his brother, even having a very similar voice and mannerisms. The next day, we visited the Blue Mosque – which is very close to the Hagia Sophia and very similar, although less grand and still used as a mosque – the Basilica Cistern – a very impressive underground chamber filled with columns that was used to store water – and the New Mosque, and we went on a boat tour part-way up and down the Bosphorus. 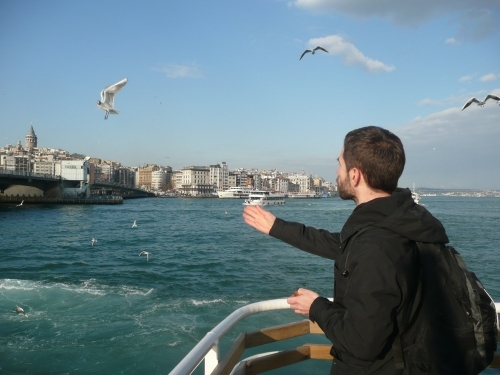 On Matthew’s recommendation, we bought some bagel-like bread called simit from roadside carts and fed it bit by bit to seagulls, throwing the bread into the air from the top of the tour boat while the birds flocked around to catch the titbits. 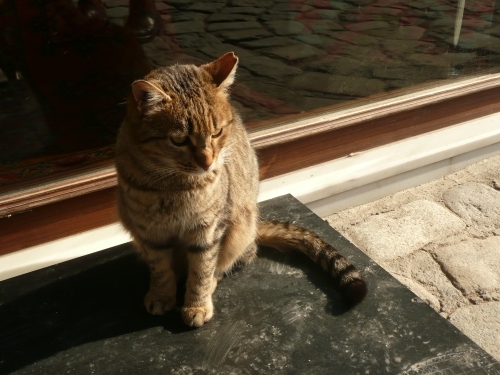 The day after that – Thursday – we went to Topkapı Palace (the letter ‘ı’ is pronounced like ‘ə’, so ‘Topkapı’ sounds like ‘top-kah-puh’. 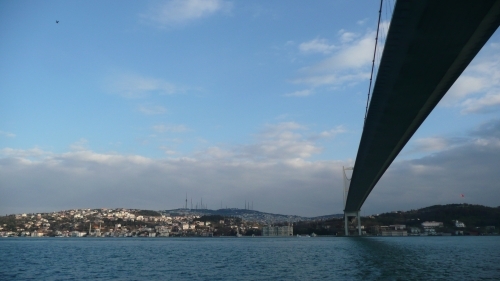 Actually, the capital form of ‘ı’ is ‘I’; the initial letter of ‘Istanbul’ is not the same and it should be ‘İstanbul’ (‘ee-stahn-bool’). 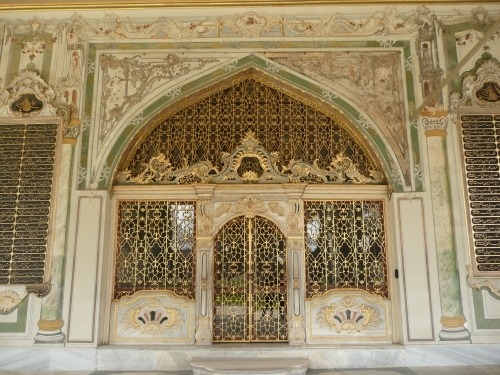 The palace reminded me of places that I visited in India, like Agra Fort. 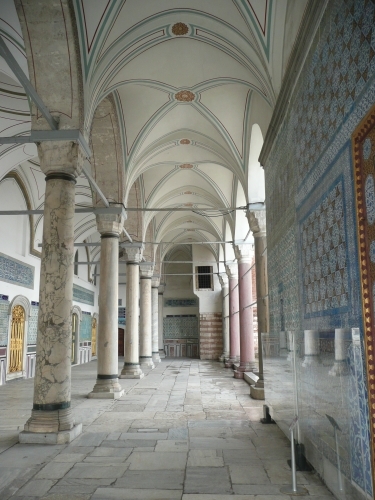 It’s a large, slightly labyrinthine complex of buildings and courtyards built largely of marble. We looked around the treasury rooms and saw various amazing artefacts like pendants formed from emeralds the size of a child’s fist, gold pitchers, writing boxes and the like covered with tiny designs. In the armoury section there was a gigantic sword that must have been seven feet long, along with golden maces and rifles that looked more like fine antique furniture. We decided not to go into the Harem because we were cold and tired and it cost almost as much again as the entry fee. In the evening, after packing most of our stuff and going out for a leisurely cup of coffee, we met Habiba’s friend Neslihan and she took us for dinner. We were shown a big tray of side dishes, from which had chose several, and we ordered fish and roast vegetables from the menu. We also had a drink called rakı, which is clear in its undiluted form, but you add water to it and it clouds up like watery milk; it tastes like aniseed. The meal turned out to be our most expensive yet. The following day, we got up very early to take a minibus to the airport, from where we flew to Izmir, south-west of Istanbul, on the Aegean coast. 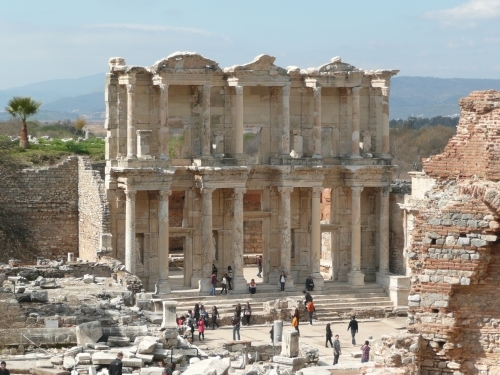 From Izmir, we took a couple of buses and arrived in Selçuk (‘sel-chook’), home of Ephesus and the Temple of Artemis.